Who's more serious about reading, Amazon or Apple? So, Apple burst onto the e-book scene almost a year ago with the release of their iPad and the iBook Store in April. But, as of 6 months ago, Apple was still only a minor player on the e-book sales scene, with Amazon dominating 75% of e-book sales and B&N with another 20% or so. Apple was hindered by (a) being late on the e-book scene, (b) the fact that reading on a backlit LCD screen just isn’t as “magical” as Apple wants you to believe, and (c) the iBook Store doesn’t have the selection of other e-book stores, with no Random House titles and only about 30,000 total in-copyright titles (compared to Amazon’s 800,000 or so). 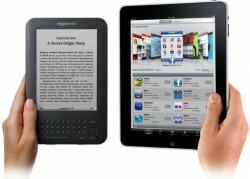 Adding insult to injury, a Codex Group survey from November 2010 found that even iPad owners were buying more e-books from Amazon (which can be read on Amazon’s Kindle for iPad app) than from the iBook Store: Amazon e-books accounted for 40% of iPad users’ purchases, while Apple e-books were 29%. I figured that this would be a good time to see just how the iBookstore has progressed. The answer, in a word: poorly … very poorly. Or how about this review? However, after six months of offering up downloadable text content to capable iOS devices, it appears that the once seemingly mighty contender hasn’t been able to do much more than land a few rabbit punches. 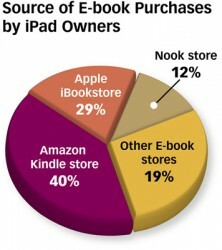 Despite the iPad’s rabid popularity, neither major publishers, nor the book buying public have embraced iBooks. After more than half a year online, Apple’s iBook Store is still only offering up approximately 60,000 titles. When held up against the 700,000 titles offered by Amazon for their Kindle reader software and hardware solutions, Cupertino’s library looks pretty weak. Did we mention that about half of the titles available as iBooks are also available from Project Gutenberg? C’mon Steve, this is embarrassing. And that came from the staunchly pro-Apple folks over at Mac Life. Ouch. So, did Apple take these criticisms to heart and improve the iBooks experience? Did they prove they’re serious about the e-book market? Has Apple gotten Random House to sign on? Increased their selection to at least keep up with Amazon’s rate of growth, let alone closed the gap? Improved their store navigation or implemented a recommendation engine? What have we heard from Apple about the iBook Store in the months since those less-than-glowing articles were written? Nothing. Well, I can’t say I’m shocked, since the whole iBook Store and marketing of the iPad as a reading device never seemed sincere to me. It’s just so far inferior to a Kindle 3 as a reading device (harder on the eyes, triple the weight, far less battery life, etc. ), it’s not really in the discussion for me. Add in the fact that the K3 is around 1/4th the price ($139 for Wi-Fi, $189 for free-for-life 3G), and there’s no comparison when it comes to reading. Did anyone really think he so dramatically changed his mind and did a complete 180 between that statement and when he made the iPad (which came out in 2010 but was probably in development even when Jobs uttered those words)? Or was “e-reader” just a convenient marketing label Apple decided to attach to a multi-purpose device designed primarily to do other things? What’s more sad is that people don’t read anymore…regardless of the format or vehicle. I don’t know if it’s Apple or the public but i’ve never seen the iPad as a reading device like a Kindle. In my opinion it’s a multimedia device (laptop-lite) that just happens to allow people to read e-books on it. The Kindle commercial with the two people pool side is pretty funny. Yeah, the overall lack of interest in reading is depressing; I wrote about it here. It would help if a person could actually browse their books. And not just on the ipad. That and the lack of proper categories makes it a pain. I buy my ebooks from Fictionwise instead. As to the comment people read less, I now read more ebooks than I ever did print. I wasn’t impressed with navigation in the iBooks Store — it’s hard to find anything other than the “featured books” and bestsellers. I also read much more on my Kindle than I used to read in print, and I’ve heard the same thing from almost everyone who has one.